I am the first to admit I am not a huge fan of retro meals, usually they are full of tinned vegetables and margarine and that just doesn’t do it for me… but one of my good friends, Mia, loves her retro food and so this one is dedicated to her. Its a dairy free spin on traditional à la King, but if you prefer to use it with dairy its a straight swap. I chose this meal for Simple Meal Sunday because its quick, easy, yummy, inexpensive and can be reinvented into so many different dishes. You can turn it into a pot pie, top it with mash for a shepherds pie, reduce the sauce down and use it in normal pies… are you getting the pie theme here? You can also bulk it up with rice, pasta or steamed veggies and serve 6 comfortably. Add cashew nuts to mixer bowl, mill for 10 sec/speed 9/MC on. Set aside. Without washing the bowl, add parsley and thyme to mixer bowl, chop for 3 sec/speed 9/MC on. Set aside with the cashew meal. Without washing the bowl, add onion to mixer bowl, Chop for 4 sec/speed 5/MC on. Scrape bowl down. Add mushrooms and chicken stock/water and cook for 3 min/100°C or 212°F/reverse/slowest speed/MC off. 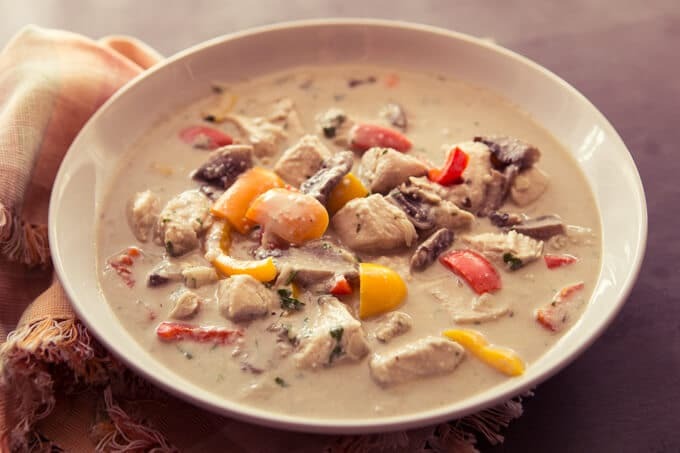 Add chicken and coconut cream, cook for 5 min/90°C or 195°F/reverse/speed soft/MC off. Add the capsicum, reserved cashew and parsley mixture, cook for a further 3 min/90°C or 195°F/reverse/speed soft/MC off - or until cooked. Substitute the coconut cream with normal cream if desired. If you would like to make this nut free, skip the milling step and mix 2 heaped tbsp of corn flour or tapioca flour with water and add with the chicken. At step 1 mill for slightly longer if necessary. At step 5/step 6/step 7 use speed 1. At step 7 cook for longer if required. Another delicious dinner option – I’m working my way through all the skinnymixers blog recipes (books are totally dog-eared) and I’m yet to be disappointed! Really creamy, so it was a big thumbs up from my dairy-intolerant partner who thought meals like this were in his past. Made this for tea tonight and didn’t have any thyme so ended up using tarragon. Also added some chives that needed to be used up. It was a little under seasoned for my tastes so I added about a 1/2 tsp of both salt and pepper at the end. Really delicious. It’s just aweful. Made it with the cream as that’s how I normally make my chicken a la king. Much better made on stove or a different recipe on thermomix. Sorry this was not great. Simple and tasty flavours that children will enjoy. Served with Parmesan on top, rice to soak up the sauce and extra steamed veggies. How much longer do you have to cook the chicken? 11 mins does not seem long enough? When meat goes into a hot sauce its time is reduced. This is just a perfectly quick and easy weeknight meal. Has anyone used the vegetable stock paste concentrate from EDC instead of chicken stock? This recipe is great! I did it with normal cream and a cup of white wine and it was great. The kids wolfed it. We served it with green beans and rice. Next time I’m going to give it a go with coconut milk. I might even swap the parsley and thyme for lemongrass and lime leaf and make it a Tom Kha Gai! Just enjoyed this simple, easy meal. Grat flavour considering the small amount of ingredient variety. A wonderful recipe to tweak to the individual needs. Thanks a bunch. I’m still trying to figure out where I went wrong sadly this was not a hit here mine was watery and bland. My first attempt at skinnymixers and usually I can cooktop ingot was an off day as I’ve planned pork belly for tonight. I had a fail too, runny & bland. Maybe it would be better with Nik’s stock? With all the great comments I’m tempted to try it again. No, you are right, not a winner here either 🙁 ive told my husband to get kfc on the way home. Thyme and coconut cream don’t taste great. Very bland. For my taste it needed a splash of wine and a little more seasoning, I think it’s a good recipe to adapt for your palate. Super simple dinner that is full of flavour. I was only cooking lunch for one. I halved the chicken and added zucchini and baby spinach leaves. Yummmmmm!!! Made this one tonight as well. Actually my whole menu plan this week is skinnymixers. Why would I go anywhere else?! The recipes are easy to follow and delicious. Thank you thank you thank you! I made this tonight and was so easy and quick (I’m a terrible cook too). I enjoyed it but the hubby and 5 year old didn’t. I will try again with dairy cream instead. I’ve frozen the left overs but have no idea if I can freeze it? Guess we will wait and see. I loved it! It was awesome. I used coconut cream as per recipe, but no nuts. This was amazingly simple to make with good flavor and filled some empty bellies. Will definitly be making this again. I left out the capsicum and added carrot. One of our family’s new favourites! I did find i had to cook it for quite a while longer as the chicken was still raw after the recommended cooking time but it was delicious. Thank you. Super easy recipe that everyone really enjoyed. And my kids are fussy! So delicious and yum! My kids had 3 bowls each! Not much leftover. Yum, had this for dinner tonight and it was delish. I added som garlic an green beans. Next time I may also add some diced bacon. Thank you, this was a nice, easy and quick dinner. This may be a silly question, but what normal/dairy cream would be best for this recipe? Have this yummy meal sitting on a bed of cauliflwer rice. It is delicious. Always thought cauli was a boring vegetable unless it was covered in a creamy cheese sauce. Cuts out on added calories of rice and the carbs for diabetics. children and hubby may not notice Either. 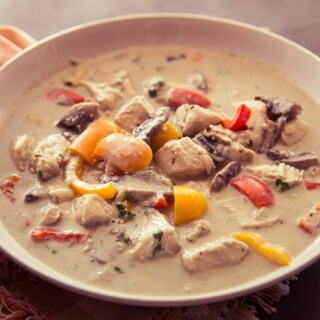 aaah, I made a version of this .. and I called it Chicken King-La – because it has a bit of a malasian feel with the coconut cream – Yumo! Super yummm, I had it over brown rice with steamed veggies and almost didn’t notice I was enjoying greens! The sauce isn’t too thick, so no guilt in it, I just left (bravely) what was in the bottom of my plate once finished. Perfect! Thank you! Loves this dinner. Nice and quick and easy! Thanks Nik! So easy and super yummy. It saved me when I had chicken out but no inspiration. Oh my this is absolutely delicious and so so easy!! I added carrot and pumpkin instead of mushrooms and broccoli and cauliflower instead of capsicum, love how versatile it is! This was delicious! I cooked half the quantity as I only had 300g chicken. Wish I had’ve cooked more!!! Fast, so tasty and ingredients I always stock (used broccoli instead of capsicum and had to cook 3 mins longer for al dente). Will definitely cook again! Love this dish. Very saucy, so quick to make and delicious flavour. This was so easy to make and delicious . We served it with mashed potato but I would be quite happy to drink the sauce like a soup. Yum! Made this last night and my husband loved it. What a very quick easy mid week meal. Love the versatility of the veggie stock, it’s great eating food you make from scratch so easily and simply . Quick and easy meal. Served this on mashed potato which soaked in the yummy sauce. Thanks for this! It was so quick and easy to make, and it tasted great. I served it with mashed potato and my partner even went back for seconds! Made this yesterday for a very quick dinner. I subbed with dairy cream and it turned out really lovely. Great understated flavour, the more you taste it the better it gets! We had leftovers for lunch today. I will cook it again. I made this tonight for the first time. Prefect meal for those busy nights. I added some sweet potato in with the chicken and mushrooms. Every one enjoyed their dinner tonight. I served this with brown rice. Made this tonight. Was so yummy. Had it with brown rice and lots of steamed veggies. Left overs for lunches tomorrow. I added chili, garlic, turmeric and coriander.